MARFC at the Brad 100 at Auto City Speedway! MARFC Members were treated to a discounted admission for the “Brad 100” that was run on August 16, 2012 with the JEGS/CRA All Star Tour at the Auto City Speedway. It was a spectacular night of racing in spite of the threatening skies all around and the predictions of rain. Track owners/promoters Joe DeWitte and Sharon Fischer didn’t let that stop them and the show went on as planned. Guest of honor was Rochester Hills native and leading NASCAR Sprint Cup Driver Brad Keselowski who was on hand to sign autographs, give pace car rides, and wave the initial green flag. MARFC was invited to take part in the festivities and to help honor Brad for his accomplishments. A “Special Recognition Award” was presented to Brad by MARFC President, Dave DeHem while the Veterans in attendance gathered around. 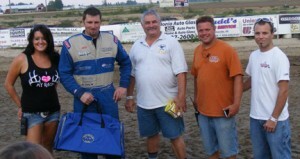 MARFC Fan Club Day Made Up at I-96 Speedway! The club had a great night of racing at the I-96 Speedway on Saturday August 25th with at least 20 members sign in at the membership table and more in attendance for Season Championship night. Zack Olger, driver of the #0 Late Model was the MARFC Helmet Bag recipient while Jason Snelenberger won the fan club drawing. Zach Olger also clinched the I-96 Modified championship that night as well piloting the 0x Modified. Board Member Denny Trinklien manned the membership table with help from Barry Meschke and Peggy Mackey. A great big Thank You to track owners/promoters Mike & Sarah Mouch for working with the club to get this date in from our earlier rained out effort last spring. Also a big Thank You to track P.A. Announcer Matt “Hollywood” Prieur and Renee House-Thomas for the many plugs for the club and all the help they gave as well and we look forward to 2013 and a return to the I-96 Speedway. Mt. Clemens Race Track 1951 to 1985 T-Shirts on Sale! GET THEM WHILE THEY LAST! MARFC Member Laura Tucker has a few Mt. 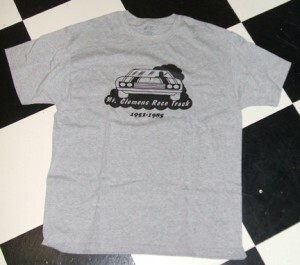 Clemens Race Track 1951 to 1985 T-Shirts in stock. She has offered MARFC part of the proceeds from the sale of the reminder of these collectable shirts to benefit the Annual Children’s Christmas Party. They are offered at $ 12.00 each for local pick up and $ 15.00 mailed out to you. You can contact Laura Tucker for more information about the shirts at: teamtuck500@yahoo.com We would like to say Thank You to Laura for this support of our sport and our club. 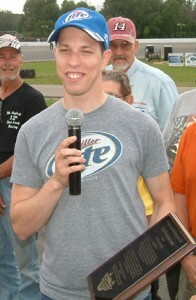 Onaway Speedway hosts MARFC Fan Club Day for 2012! August 11, 2012 For the second year now, Jim and Krista DuBois have invited the club up to their track in Onaway, the Onaway Speedway for some great racing action at this spectacular facility located in the heart of “God’s Country” in northern Michigan. 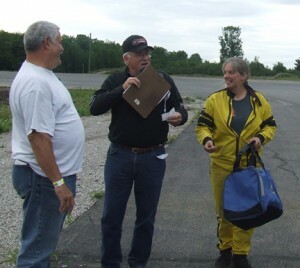 Board Member Denny Trinklien manned the MARFC Member table with help from 2011 “Co-Fan of The Year” Barry Meschke who incidentally got to give the command to start engines as well. Track P.A Announcer “Oval Revvin” gave some great plugs and information on the club all night and was another great help on this night when many Michigan Speedways were inundated with rain water. The MARFC Helmet bag was presented to Current point leader in the sport mod class, the driver of the #89, Chantelle Paquette who also was wheeling the #88 pure stock in competition to boot. Longtime track supporter and good friend to MARFC, Eldon McMillan was the winner of the member raffle prize. 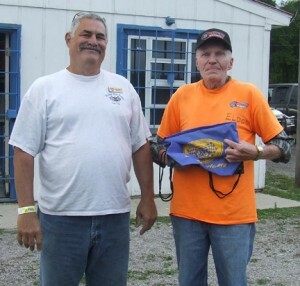 Eldon has been a longtime attendee and supporter of the Onaway Speedway so it was great to see him win the member raffle. Many thanks to Jim and Krista as well as our table helpers for another great event.